I haven't visited this blog for ages and I think it's time for me to clear the cobwebs. 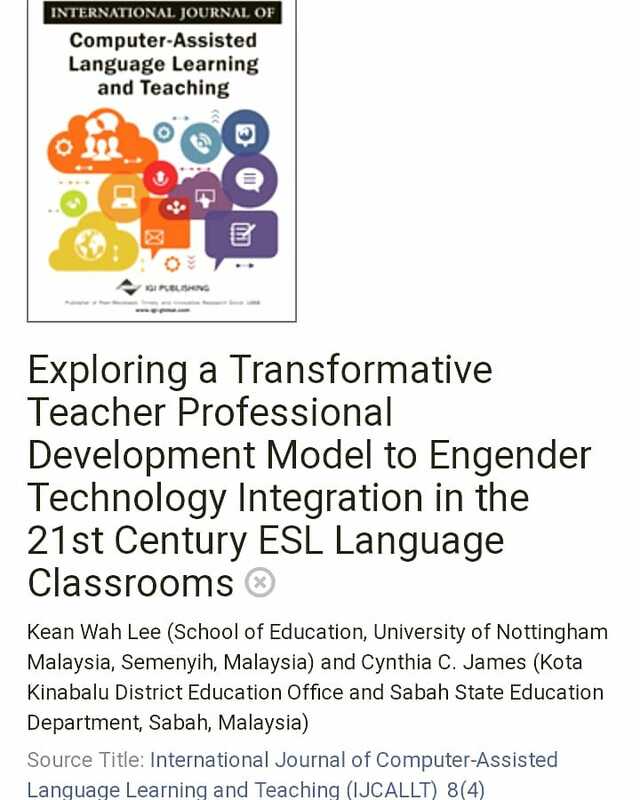 :) After my presentation at the 22nd MELTA conference in Johor Bahru last May, some friends have been asking me to put up my presentation materials on this blog because they want to know more about how I use songs to teach sentence constructions to 'weaker' students. I'm glad I receive the request because it gives me an excuse to start writing again. 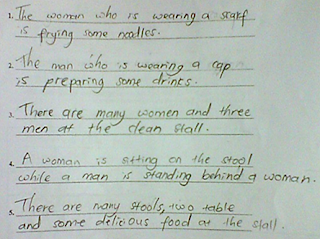 For those unfamiliar with the UPSR English paper, the task for Question 1, Paper 2 is for the students to write five sentences based on the picture given. 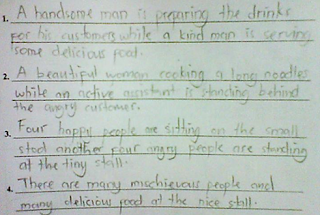 There are ten words provided and the students can use them in their sentences. 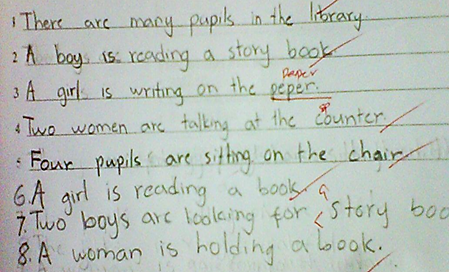 It is however not compulsory to use the words, students wouldn't lose marks if they don't use any of them. 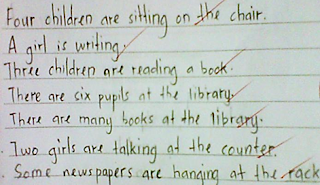 Many Year 6 teachers who are preparing their students for the examination would normally train their 'weaker' students to write sentences in Present Continuous Tense to answer this question. 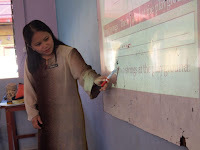 At first I thought it's because that is what is required by the UPSR examiners, but a friend explained to me that it's because sentences in Present Continuous has a simpler structure, and are easier for students to remember and understand. Students don't have to be confused by subject-verb agreement as in Simple Present, or remember the correct past tense forms for verbs as in Simple Past. They just have to remember to use the correct verb to-be, and this is as simple as remembering when to use 'is' and when to use 'are.' 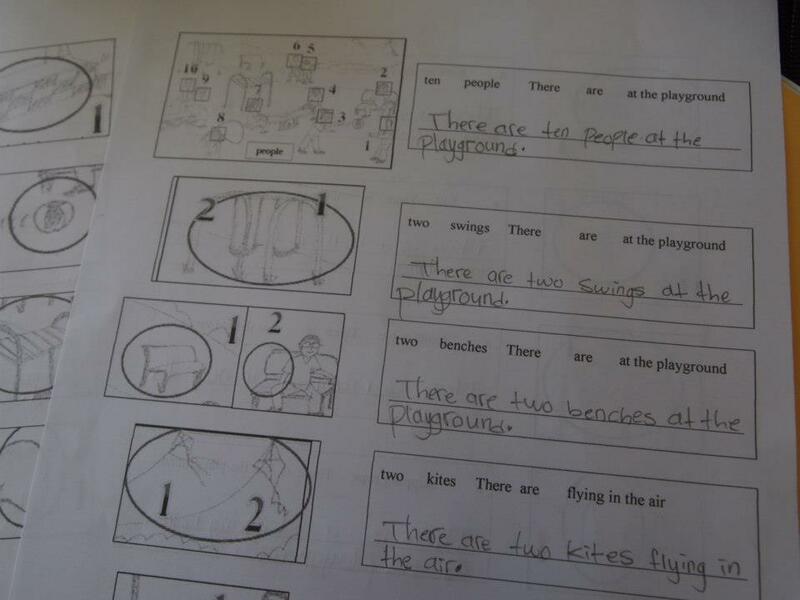 It would minimise mistakes made by the students, and help them get better marks for the question. It didn't work very well. My students were still confused. 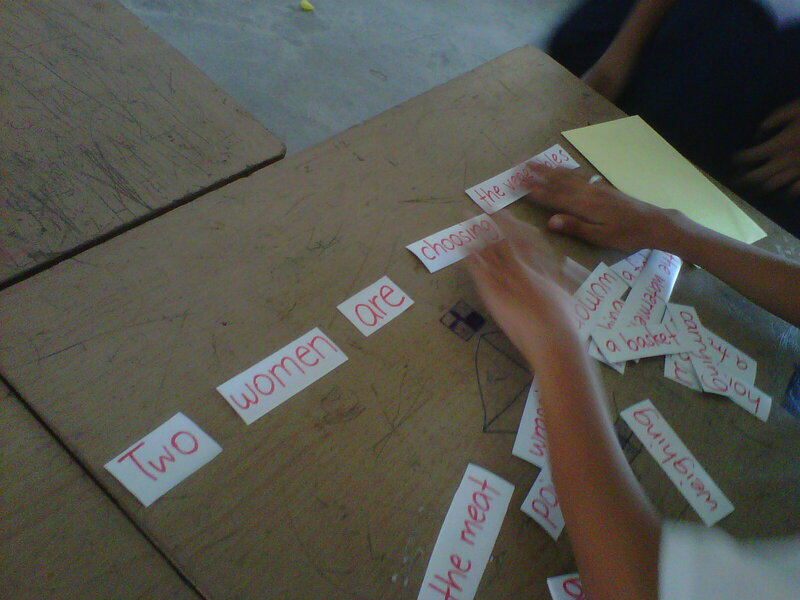 They were not able to remember the structure and couldn't construct sentences without the table. Many of them thought the table was too complicated and wasn't very useful. So our writing lesson always began with us 'singing the structure' first, before moving on to constructing the sentences. My students loved it. The melodies helped my students remember the structure, and after a week of 'singing the structure' they were able to draw both tables from memory. And it improved their sentence construction skills. The students were able to write grammatically and structurally correct simple sentences. Some of the sentences look funny, I know. Especially the ones with the adjectives. :) But the students had progressed so much, in January they didn't even expect that they would be able to construct such sentences. Their confidence in writing soared, and that made me extremely proud. I used the scaffolding strategy to help my weaker learners improved their writing skill. 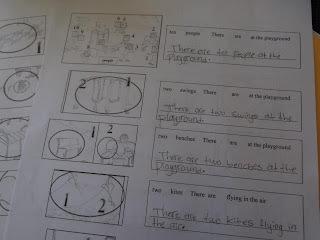 I started with modelled writing, where I demonstrated step-by-step how I construct sentences based on the picture, using the sentence structure as my guide. Then, we moved on to shared writing, where we write together. 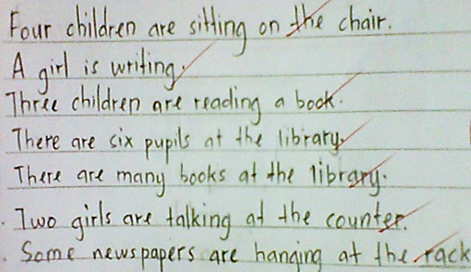 I would write the first part of the sentence, and then I would let my students continue. 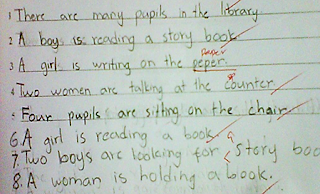 Or I would list down all the verbs or the subjects, and let the students construct sentences based on the list. We also did group activity where my students would collaborate with one another to construct sentences. 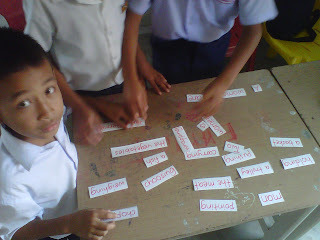 I would divide the students into smaller groups and give each group a set of word cards. Then I would show a picture and the students would work in their groups to arrange the word cards and form sentences based on the picture. 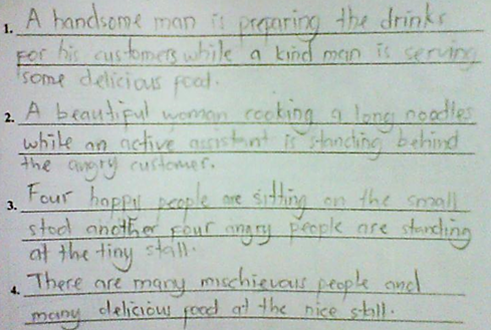 When the students had gained some confidence, I would let them write individually, but with guidance. Normally I would give them worksheets where they would have to rearrange words to form sentences, or fill in the blanks with the correct words. I would reduce the control gradually, until my students were able to write independently with little or no guidance from me. I don't believe that writing should be confined to 'formulas' or structures. I want my students to be able to use writing to express ideas and feelings, but I also realised that in order for them to do that they would have to have the vocabulary, the grammar and the skills first. So I think perhaps giving them the basic skill of sentence construction is the right first step. 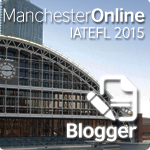 I also want my students to be able to write in other tenses, and explore other sentence types. Since most of my students respond very well to music, I think I'm going to explore more ideas on how music can be used to improve my students' writing skills. 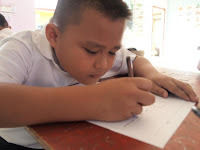 I also hope to focus on expanding the potential of guided and scaffolded writing strategies to help my weaker learners write sentences in other structures or tenses, in paragraph level or higher. Bodrova, E., & Leong, D. J. (1998). Scaffolding Emergent Writing in the Zone of Proximal Development. Literacy Teaching and Learning, 1-18. Clabaugh, G. K. (2010). The Educational Theory of Lev Vygotsky: A Multi- Dimensional Analysis. New Foundations, pp. 1-18. Feden, P., & Vogel, R. (2006). Education. New York: McGraw-Hill. Oczkus, L. D. (2007). Guided Writing: Practical Lessons, Powerful Results. Portsmouth: Heinemann. Vygotsky, L. (1978). Mind in Society. Cambridge: Harvard University Press. Wow..what a brilliant idea!You really help me much in dealing with my own weaker students.Thanks cyn. Hi. I'm very interested in your ways of teaching writing to pupils. 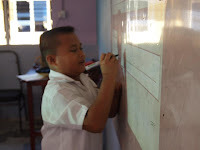 My year 5 pupils also faced the same problem in writing and they are going to sit the UPSR examination next year. I would like to ask for your permission to use your song as my intervention in my action research. I would love to hear from you soon. hi Cindy. A superb idea indeed to use songs. Yes kids love to sing. I could not get the link 4 the songs cos of copyright I guess. Is there any other way I can get the links to the songs. tq again. Hello! 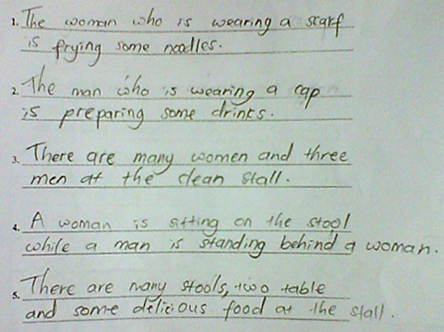 I like the way how you teach your students on the simple sentence construction. May I have your permission to use your songs and technique for my action research please? Wooww..thank you..I really love your ideas and motivate me to encourage them to like English. Thank you, thank you and thank you..I will try your method to help my 'weak students' to pass this subject in coming exam.